Back working on the shed – it’s close, it’s very close! 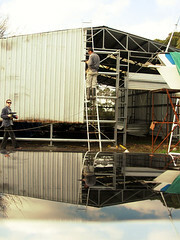 Today I handed large sheets of tin up to M who was perched at the top of the ladder. He would then secure it with one tech screw, while I checked it and tweaked it with the spirit level. When I wasn’t doing that I was going around the shed and putting in tech screws where we’d missed them in our hurry to get the walls on. It took quite a while.